Dedicate New Signs, Run a Race, Learn about Trees in daytime Tours & evening Presentations, Eat and Drink on the beautiful Blackfoot, Attend a NW Collegiate Timbersports Competition and More ! April 20 (Sat) to 28 (Sun) “A Walk Through Time: From Stardust to Us” exhibit on the UM Oval. The exhibit starts at the Grizzly Bear statue, with every step taking you back in time a million years. This exhibit consists of 90 colorful panels that depict points in time of the 4.6-billion-year life of the solar system and planet Earth. Exhibited by the Environmental Studies Program (EVST) at UM, it is one of only three in the world. April 22 (Mon) Arboretum Tour, 5:30 - 7:00 pm – Meet at "the Root” - just north of UM’s Main Hall. Facebook event. April 24 (Wed) Community Arboretum Night for your State of Montana Arboretum at Bonner Kettlehouse 3 – with food from Chameleon Mobile Kitchen. Bring your friends for good beverages, good food, and a raffle for a good cause. 5:00 - 8:00 pm. Facebook Event. April 25 (Thurs) Trees and Climate Change – Act Locally Panel Discussion, 7:00 - 8:30 pm, Interdisciplinary Science Building, Rm 110. Facebook Event. 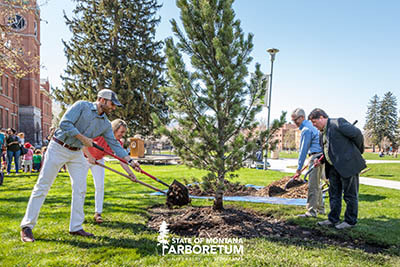 April 26 (Fri) Arbor Day at "the Root” - State of Montana Arboretum – just north of Main Hall. Facebook Event. April 26 (Fri) A preliminary collegiate lumberjack competition as part of Forestry Days at Fort Missoula from 10 a.m. to 5 p.m. at Fort Missoula. The competition will be followed by a spaghetti dinner from 6 to 9 p.m. in Garrett Grothen Arena to benefit the UM Student Recreation Association and a silent auction to benefit the UM Woodsman Team. April 27 (Sat) Arboretum Tour - 11:00 am - 12:30 pm - Meet at "the Root" just north of Main Hall. Facebook Event. 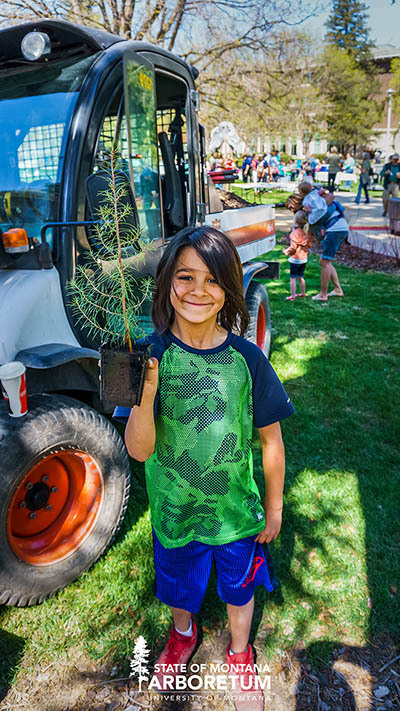 April 27 (Sat) Forestry Days at Fort Missoula from 9:30 a.m. to 4 p.m. at Fort Missoula. Events are hosted by the Society of American Foresters in association with the Montana Woodsman Team and the Historical Museum at Fort Missoula. Events include a one-of-a-kind logging show in which professional and collegiate lumberjacks (including UM’s Woodsman Team) compete. These logging athletes hail from across the Pacific Northwest and Canada. Events include cross-cut sawing, wood chopping, pole climbing, axe throwing and more. There will also be antique logging equipment demonstrations and other displays. Draught Works will host a beer garden. In 1991, the UM Campus was designated the State Arboretum by act of the Montana Legislature to “facilitate the scientific study and public exhibition of many species of trees and shrubs.” With 2,300 trees of over 100 different species, the arboretum is free, open year-round and accessible to all. In addition to emphasizing Montana habitats, the arboretum showcases trees and shrubs of eight North American bioregions: Great Plains, Central Hardwoods, Northeastern and Southeastern Mixed Forests, Northern and Southern Rockies, and Pacific Coast and Boreal Forests. Additional arboretum features include Memorial Row, an allee of Ponderosa pines planted in 1919 to commemorate 32 UM war dead; a 1993 Montana Centennial planting of one tree or shrub representing each Montana county; the recently replanted double ring of maple and oak trees on the Oval, emulating the original 1899 planting; and Montana native-plant gardens around the former Botany building.